John The Baptist - Only "A Voice"
"This is the record of John, when the Jews sent priests and Levites from Jerusalem to ask him, Who art thou?" John 1:19. It is ever welcome to any right-minded person to be asked to speak about himself. So, I doubt not, John [the Baptist] found it. He readily told them he was not the Messiah, that he was not Elias; yea, that he was not even the prophet. But they would have a positive answer. "They said unto him, Who art thou? that we may give an answer to them that sent us. What sayest thou of thyself?" Little indeed had he to say of himself. "I" had a very small place in John's thoughts. "A voice." Was this all? Yes; this was all. The Spirit in the prophet had spoken; John quotes the words, and there he leaves it. Blessed servant! Honoured witness! Would we had more of thine excellent spirit! — more of thy method of answering questions! 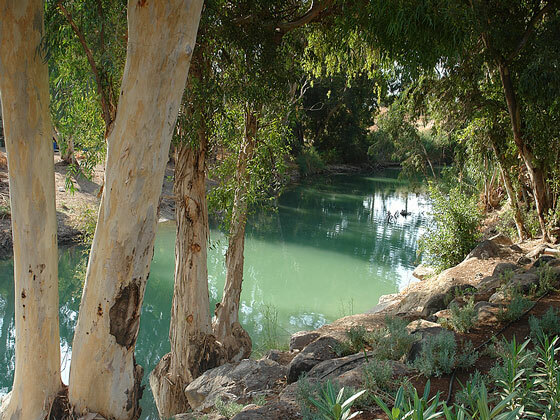 The Jordan River, where John the Baptist baptized repenting sinners two millennia ago. But these Pharisees were not satisfied. John's self-hiding spirit was entirely beyond them. "They asked him, and said unto him, Why baptizest thou then, if thou be not the Christ, nor Elias, neither the prophet?" Here again the Baptist makes short work. "John answered them, saying, I baptize with water; but there standeth one among you whom ye know not. He it is who, coming after me, is preferred before me, whose shoe's latchet I am not worthy to unloose." Thus, as to himself, he was merely a voice. And, as to his work, he baptized with water, and he was only too glad to retire behind that blessed One whose shoe's latchet he felt himself unworthy to unloose. In a word, what I long for is that you and I, and all our dear brethren throughout the whole world, may be characterized by a deep-toned, thorough, devotion to the name, and truth, and cause of Christ. I long to cultivate broad sympathies, that can take in every true lover of Christ, even though we see not eye to eye on all minor questions. At best "we know but in part"; and we can never expect people to agree with us about questions. But if Christ be our one absorbing object, all other things will assume their right place, their relative value, their proper proportions. "Let us, therefore, as many as be perfect [as many as have Christ for their object], be thus minded; and if in anything ye be otherwise [or differently] minded, God shall reveal even this unto you. Nevertheless, whereto we have already attained, let us walk by the same rule [Christ], and mind the same thing" (Christ). The moment anything else but Christ is introduced as a rule to walk by, it is simply the work of the devil. Of this I am as sure as that I hold this pen in my hand. May the Lord keep us all close to Himself, walking together, not in sectarianism, but in true brotherly love, seeking the blessing and prosperity of all who belong to Christ, and promoting in every possible way His blessed cause, until He come!